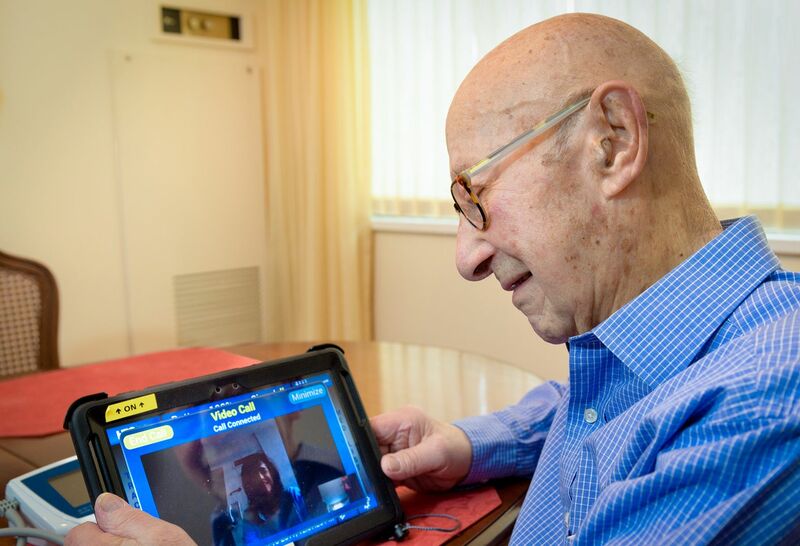 An elderly man utilizes a telehealth program. Home telemedicine programs for heart failure are effective at preventing death for at least six months after hospitalization, but generally lose any benefit after one year, according to a meta-analysis of clinical trials published today and announced tomorrow at a briefing. These findings, published in the December issue of Health Affairs by a study team led by Feinstein Institute for Medical Research Professor Renee Pekmezaris, PhD, help educate health care professionals how to refine heart failure telemedicine programs and about who most benefits from these programs. Dr. Pekmezaris will speak about this topic at 11:40 a.m., December 4, at the Health Affairs briefing hosted at The National Press Club in Washington, DC. Heart failure occurs when the heart muscle does not pump blood as well as it should. An estimated six million Americans have heart failure, half of whom die within five years of diagnosis. One way to decrease heart failure mortality is to be cognizant and proactive about symptoms post hospitalization. It is challenging for patients to continuously monitor symptoms and notify professionals, but this is a critical step for the patient’s health because medications and diet may need to be adjusted. Dr. Pekmezaris’ important new findings are critical to saving lives by harnessing new technologies to assist patients even after they have returned home. Home telemedicine programs offer a solution. They are comprised of health care professionals monitoring important vital signs and teleconferencing with patients on a regular basis to discuss their symptoms with the goal of identifying issues sooner and preventing re-hospitalization. Dr. Pekmezaris’ analysis of 26 telemedicine programs in randomized, controlled trials for heart failure found the programs are effective, but lose their effectiveness over time. Another interesting finding from the analysis was that despite industry expectations, home telemonitoring doesn’t necessarily stop hospitalizations – in fact, it increases the odds of all-cause emergency room visits. This is actually a good thing because if the patient is determined to be experiencing a serious episode – the emergency room is the right place to be. “Dr. Pekmezaris’ important new findings are critical to saving lives by harnessing new technologies to assist patients even after they have returned home,” said Kevin J. Tracey, MD, president and CEO of the Feinstein Institute.